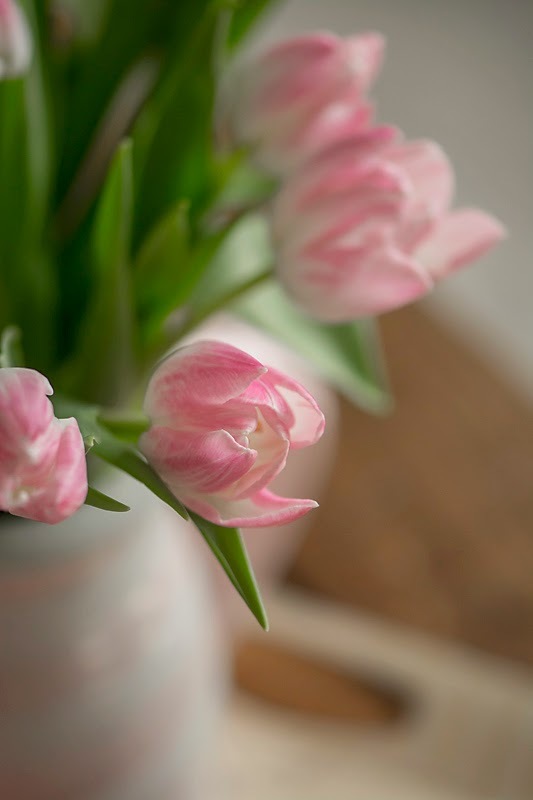 Did you know that the average amount that a tulip stem "grows" after it's been snipped is 1 inch? How is that possible? The flower is phototropic. Look at that word again....you thought I misspelled photographic. Well, admittedly they are photographic, but the spelling is correct, it is phototropic meaning it stretches toward sunlight, even when snipped, placed in water and sitting in a lovely vase. So to keep your bunch (of which I bought 2 after church on Sunday....Trader Joe's is just across the parking lot) pert and pretty, rotate your container 180 degrees every day. This way the tulips won't lean too far in any one direction as they extend to that 1 inch. And to keep them fresh and and staying longer, trim the stems and change the water daily. Well, holding my breath, we have had no snow for a few days, every bit of snow is gone from the front yard (replaced with mud that my kids find with no problem) thus presenting me with, you got it, muddy paws. If Toby weighed a pound heavier I would not be able to pick him up and commence the foot bath in the kitchen sink. It was while I was giving said foot bath that I spied out the kitchen window the sweet little house finches house hunting. Or I should say nest hunting. I have a lot of ivy growing up the sides and under the eaves of the screen porch and it appears that they may put on option down on a spot under the eaves. Mr. was already gathering bits to begin the furnishings, a sure sign of Spring. Boy I did a rotten job of clean-up last fall. That is a double dead hanging planter that the Mr. is helping himself to. Well at least it is getting some use after hanging around all winter. Have you watched any of those new TV shows that started a week or so ago....Resurrection is one and the other is Believe? Resurrection has me curious and Believe leaves me exhausted after all the running and hiding. And then "Dancing With The Stars" is making it's appearance again for the 17th time. But I gotta admit here I am having some trouble with who is the star and who is the dancer. So many faces I don't recognize, but both of those Olympic ice skaters can move around the dance floor as beautifully as they did on the ice. Derek's partner (he is one of my favs) the lady that had both legs amputated, amazing. And I also have to say that Erin Andrews does a bang up job with co-hosting. Hint....tape it and watch it without all those dang commercials. The 2 hour show can slide into 1 hour with omitting all the ads and the extras. Hope you are having a star studded week, and Spring is making an appearance in your world. 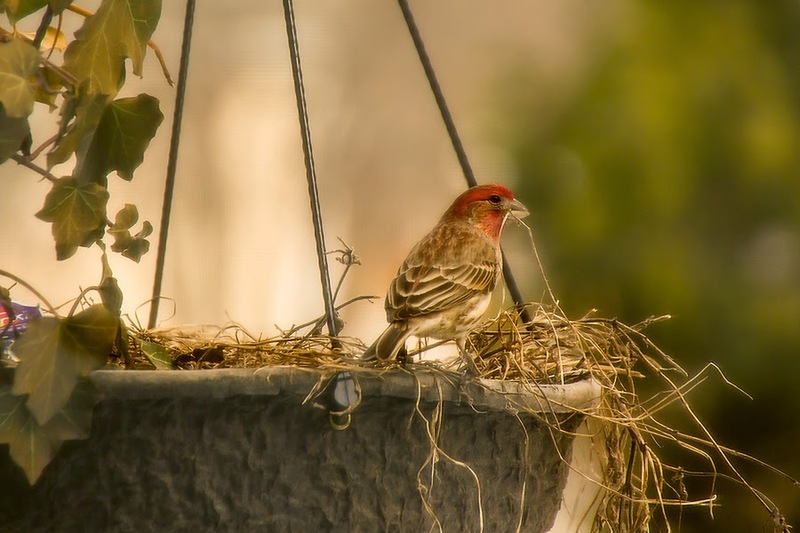 love your sweet house finches! and your pretty tulips, too. Such pretty goings on at your house. Your finch images will be favorites . . . loved the ivy and nesting with last year . . . I put my boots away and wore shoes without socks today . . . it was cool but wonderful . . .make sense! I had such a lovely visit, Deanna! The pinks in the first photo are just lovely. 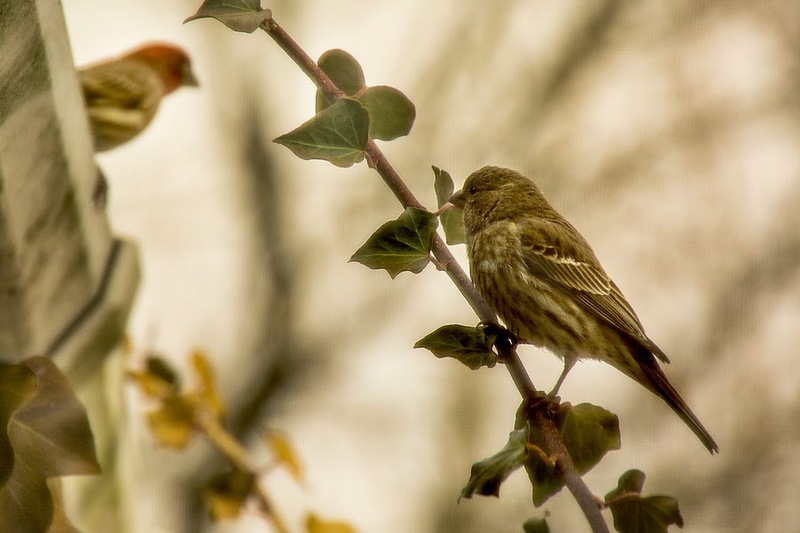 And the little house finch is so pretty! I haven't watched those shows. There are only a few shows I watch regularly--plus a lot of "Law and Order" reruns. We do watch "Justified." It's got some violent themes, but the characters are engrossing. Wow! Those Tulips are gorgeous! Thanks for sharing them with us!! 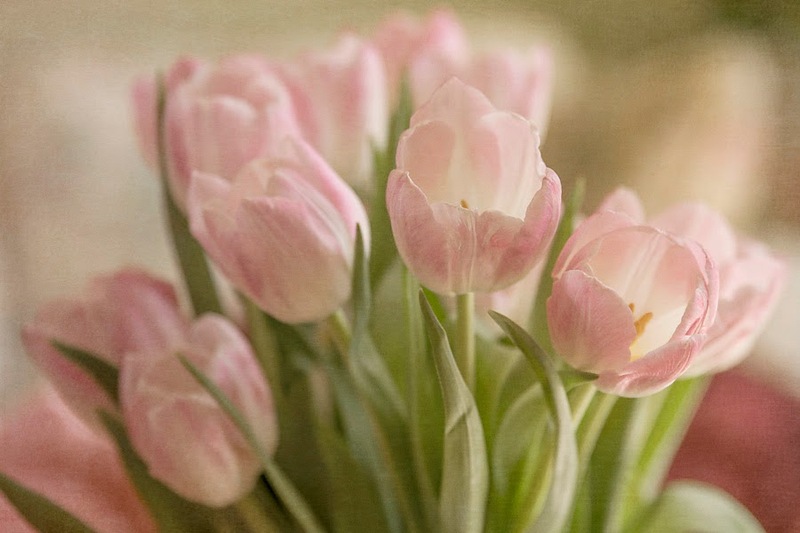 Hi D Perfect;y Pink Tulips. Marvellous and how you edited them and I love the Finches. Ga! First of all - Love all the pink and your shots are amazing! I have to say that your writing always keeps me hooked. I love the transparency and the humor! And I have to tell someone that my new secret obsession is The Voice! I could never keep the dancers straight either! Blessings! Look like spring is happening! Wish I had a Trader Joes. I'm not crazy about the ones I get at the grocer's...the flower is so little. I liked the first episode of Believe, but had to choose between The Good Wife and it, and TGW won! Now I realize on can see Believe free on Charter's On Demand. Love the tulips with the texture Deanna, so pretty and a beautiful edit. The finch with the red Mr. is just wonderful love that big of nesting in his beak. I kinda liked Dancing this week and found myself surprised as I have been not liking the show from the last season. Haven't watched the other two shows you mentioned too many already on my list that I don't need to add any more. :) Hope Spring is coming soon for you. I did not know that about tulips, so thanks for the tip! Your photos of them are beautiful. Watched Believe and thought it was too convoluted and kinda stupid. But that's just my opinion. That is such a sweet pink color and beautifully displayed and portrayed. Thanks for the tulip tips! I've not hear this about tulips, Deanna. How neat is that??? I just love your little feathered friends. The photographs you made of them are just gorgeous, and they look so content. Beautiful tulip shots! So soft and colorful. Amazingly beautiful photos, as always, Deanna! So happy to hear spring may not be far off for you. Birds nesting is a sure sign it's not far off! I did know that about tulips and turn mine every day but I recently heard they will last longer if put somewhere nice and cool at night so I put mine outside (where our lows are about 55). It works! Maybe the screened-in porch would work for you? As far as the TV shows, I completely agree about DWTS! I think Erin Andrews did a wonderful job! So much more relaxed and spontaneous than Brooke Burke. Loved Derek's partner (he's my fav too!) and the Olympic skaters were fabulous. I think it's going to be a fun season. I saw a little bit of an episode of Resurrection and thought it looked promising so I have set it for recording. You're right -- that's the only way to watch TV! Takes less time and you don't have to watch the commercials! What a great quote! And I especially love that first shot. You have such a knack for putting things together in beautiful ways! Your tulip photos are beautiful. 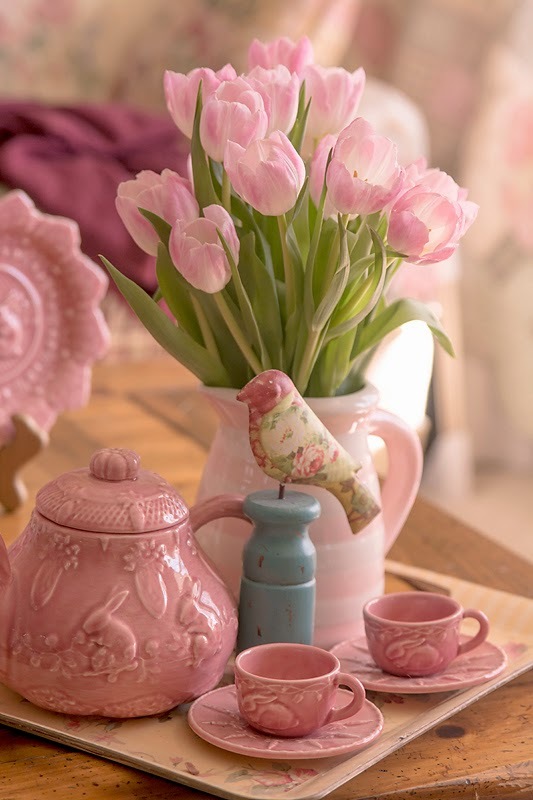 I love that pink bunny tea service and the sweet little bird in the first shot. Did I tell you a Trader Joe's opened near the Denver house? I can't wait to be just like you and go buy some flowers! Are you still watching Blacklist? I think James Spader is the best! I go outside most every day and throw some crumbs for the Gray and Blue Jays - how do they survive our winters? Can't put feeders out because they draw coyotes and bears (who will soon be out of hibernation). Your busy finches have found a nice place to raise their family. Beautiful photos.